With over a thousand islands In Croatia, you’re sure to find an experience that suits just you. Croatia’s appeal is due to the diversity of sights and activities that you can see and experience in this sunny country. It has something for just about everyone, beaches, beautiful national parks and medieval architecture. It’s a place where nature lovers, history buffs, those who like to party and those who like to take it easy can all find their paradise. Croatia is our pick due to the natural beauty of its national parks for hiking, its beaches for relaxing or water activities, its offering of festivals and party areas, its taste of the past in its old medieval city walls and of course it's incredible food and wine. Come visit this melting pot of culture today. We have packages tailored to all needs and budgets. The below is just a handful of featured trips. So contact us to discuss your dream holiday. 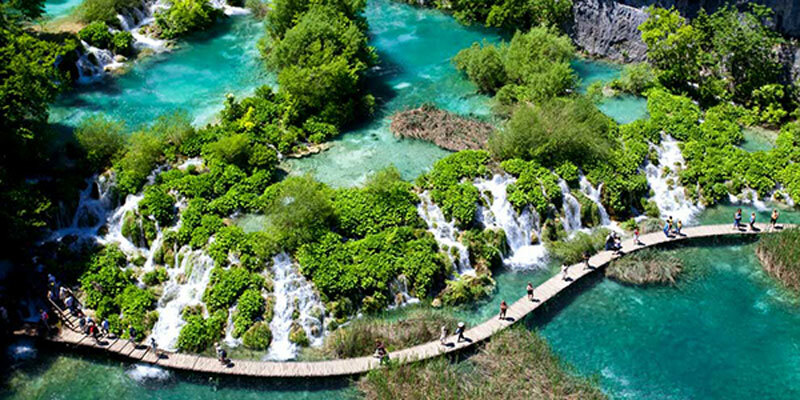 In the centre of Croatia is the beautiful Plitvice Lakes National Park. The National Park is famous for its chain of 16 terraced lakes that are joined by waterfalls. Spend time in this beautiful oasis which is the oldest national park in south east Europe. Swimming and fishing are not permitted at the park which contributes to the beautiful crystal clear waters and abundance of fish in the water. Buses and boats can take you across the park if you don’t feel like hiking the whole time you’re there and there are a variety of walking trails available for all fitness levels. If you want to experience picturesque natural beauty and gorgeous crystal clear water with a backdrop of stunning green forests, Plitvice Lakes is the place for you.